If you’ve been keeping track of the headlines lately, then you’ve probably cottoned on to the fact that plastic isn’t so good for us, especially for storing hot food or liquid. Which is why I’ve made it one of my “green goals” this year to eliminate plastic from my kitchen. So far, I’m doing good. The Gladware is mostly gone, and I’ve started using glass and stainless steel containers instead. All this is why I was super geeked when Lunch Bots contacted me a few weeks ago to take a look at their stainless steel lunch containers. 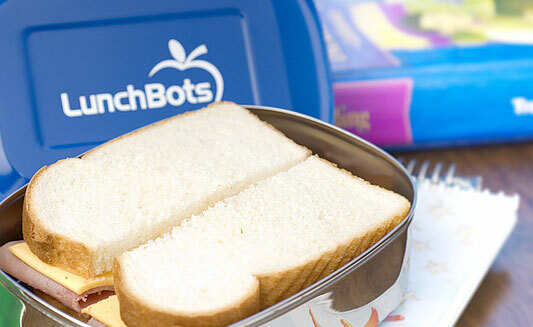 Lunch Bots was started by Jacqueline Linder, a parent who was looking for safe, non-toxic food containers for her kids’ lunches. She had a hard time finding lunch containers that she felt were safe, so she decided to just make her own. Stainless steel was the safest way to go, so she jumped in feet first and didn’t look back. And thus, Lunch Bots was born. Jacqueline was kind enough to send me a sample of both her products, the Uno (which is the first picture) and the Duo (on right). It’s safe to say that I whole-heartedly love them both. First of all, they’re the perfect size for lunch. As you can see in the first picture, the Uno is perfect for sandwiches. And the Duo is great for a small salad and side of fruit, or cheese and crackers, or sushi and seaweed salad, or tons of Oreos…the possibilities are endless. Now, neither one of these stainless steel lunch containers are water-tight (I haven’t yet seen any stainless steel containers that are), so you can’t put things like thin salad dressing or spaghetti sauce in there. 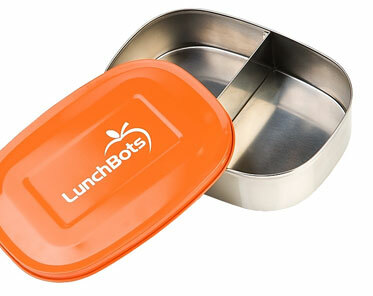 The lids fit very well, but if the Lunch Bot flips over in your lunch bag you might have a mess on your hands if there is liquid in there. The great thing about stainless steel lunch containers is that they’re going to last you forever. They don’t leach chemicals into your food like plastic, and they don’t wear out over time. And with the brightly colored lids, they’re super cute to have in the kitchen. My final vote? Five out of five stars on the Lunch Bots. There was nothing I didn’t like about them, and they’re definitely containers that I’m keeping for the long haul. I love putting food (even leftovers) in them and feeling safe that no nasty chemicals will leach into it over time.